Enjoy the delicious blend of baby corn and capsicum in a mouth-watering blend of spices. 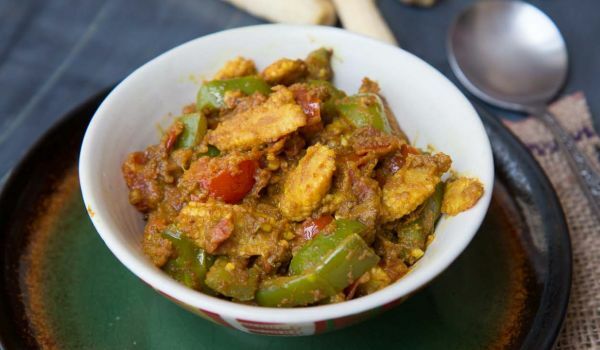 Learn how to make/prepare Baby Corn Capsicum Masala by following this easy recipe. Chop the baby corn into small pieces. Wash the potatoes and peel them. Cut them into medium-sized pieces. Add the chopped potato, baby corn and fresh beans to a bowl of salt water. Cook this in a cooker for 15 minutes. Peel the onions and chop them into tiny pieces. Add the chopped onions, tomatoes, ginger, garlic and cashews to a blender and blend until it becomes a smooth paste. Add water, if needed, in order to get the right consistency. Take a pan and add 5 teaspoons of cooking oil to it. Once the oil is hot, add the chopped capsicum and fry for 2 minutes. Transfer the capsicum to another bowl. Add 1 teaspoon of oil to the same pan and heat the oil. Add mustard to the oil once it is heated. Once the mustard stops sputtering, add chili powder, turmeric powder and garam masala powder to this and fry this well. Add the previously blended mixture of chopped onions, garlic, etc to the pan and cook over a low flame. Stir the mixture until the water in it evaporates and the gravy begins to get thick. Add the vegetables that were cooked in the cooker and cook for 1 minute. Add the fried capsicum and salt to taste. Add kasthuri methi and cumin seeds. Stir for 2 minutes and take the pan off the heat.